The Estacada Community Center has a touch of the outdoors inside of its building. 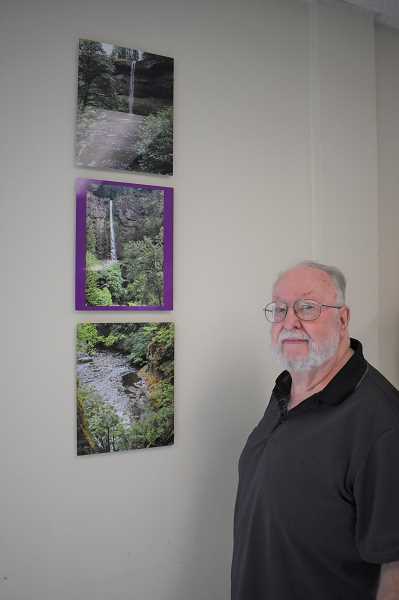 Community center staff partnered with local photographer Boyd Holloway to feature a series of his work on nature, including Mount Hood, the Clackamas River, lumber and flour mills, and mountains in Peru. "We try to have photos that are of local things," Holloway said. There's approximately a dozen photos on display at the center, all of which are for sale. As a piece is sold, a new item will take its place. A portion of the proceeds from sales benefit the community center. Of the pictures on display, Holloway particularly appreciates those that depict Lost Lake in the Mt. Hood National Forest, where the ashes of his late wife and two sons are buried, and a former Lumber Mill in Sandy, where his father used to work. One of his favorite elements of photography is working with light. "I enjoy how light hits things," he said. "The early morning and evening light bring different characteristics to a subject than a daytime light. It brings out the textures." Holloway has been interested in photography for more than 70 years. During his career, he has worked for radio and television stations, as well as advertising agencies. He is the former president of the Portland Metropolitan Photographers Association and at one point had four photography studios. Along with having photos displayed at the center at 200 S.W. Club House Drive, Holloway is also a member of the Spiral Gallery.